This 54 gallon All Glass bowfront corner tank was initially set up as a seahorse tank using an All Glass 60 gallon hexagon. I had two of these 60 gallon hex tanks leak in sucsession and all occupants of the tank(s) were eventually transferred to this 54 corner tank. This tank used no live rock, only dead coral skeletons collected while on tropical vacations. 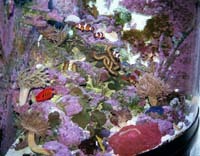 The first 60 gallon hex tank was set up in 1998. Lighting is provided by 4 - 24 " VHO bulbs. Calcium maintenance is by calcium hydroxide water exclusively. An Aquamedic Turbofloter T-1000 skimmer is used on this system.